Once again, I have returned to school and resumed my studies as a full-time student. I am very excited to call Missoula, Montana home for at least the next couple of years and this town presents unlimited opportunities to explore. 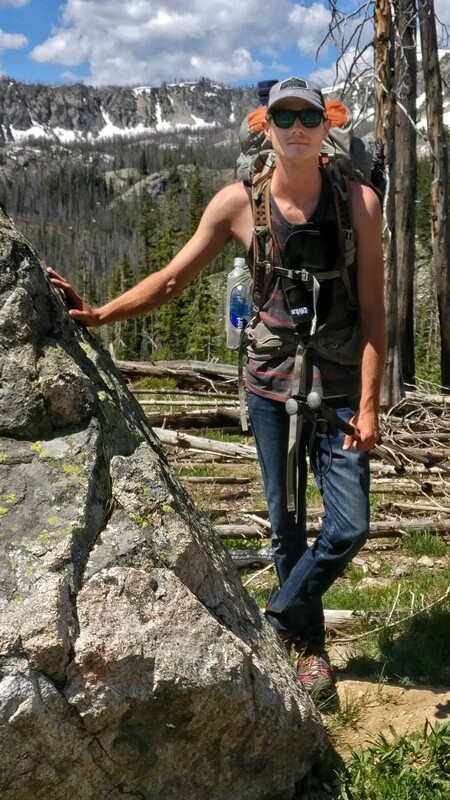 Unfortunately schoolwork and other activities will leave little time for backpacking until summer next year, but I will do my best get out and hike a bit. So today, I had a few hours and decided to embark on my first hike in the area. 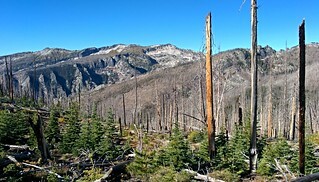 It was a short day-trip to Glen Lake in the Selway-Bitterroot wilderness which is southwest of town. 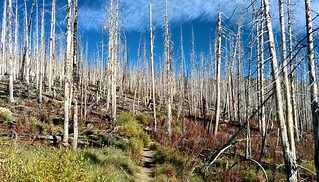 The trail travels through a large burn area from a 2006 fire for the majority of the hike and is just under 6 miles round-trip. 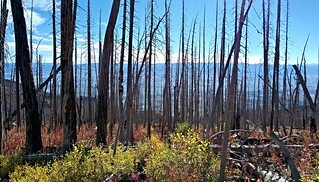 I actually really enjoy hiking through burn areas because the ghostly snags and blackened stumps provide a wonderful contrast against the varying colors of returning vegetation and also open holes to view the surrounding scenery. 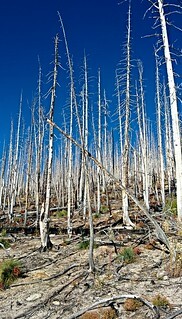 Also, if you know me, you know I’m an outspoken critic of wildfire suppression and even though this was a somewhat unnatural stand-replacing fire, we have only ourselves to blame. Glen Lake trailhead sits at about 6,600 feet and provides a starting point which eliminates a whole lot of climbing that would be otherwise necessary.The trail rises up over the ridge, traverses a large bowl, and after more than 900 feet of steady elevation gain reaches the lake. Glen Lake is small but very scenic due to its rocky shoreline and the eerie black crags which rise above it. 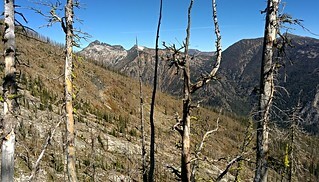 I was thrilled to see a number of mountain Larches in their transition to fall colors still standing in the area. It was a beautiful sunny day and I sat and enjoyed my lunch on a boulder next to the water. A short loop trail heads uphill from the lake to a bench which holds the even smaller Hidden Lake. Hidden Lake actually consists of two separate lakes, contrary to what the map shows as one. The lower lake is very small and really more of a pond especially due to the dry year which is evident in the high water-line on the rocks. There were even more yellowish-green larches up here and I have to say I love these small rocky bodies of water because they have a lot of character. 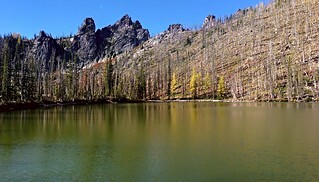 Many of the lakes in the wilderness require much further hikes and therefore this a popular area. I got an early start and reached the lake by about 11 am, running into only one couple who had spent the night there. However on the way out, I passed no less than 26 people, something I’ve only experienced in the well-used county park near my hometown. This may be something I’ll have to get used to living in such an outdoor-oriented town like Missoula. Fortunately, there’s thousands of miles of trails to explore within a short drive of town and many hundreds of lakes without trails which are sure to include solitude. Thank you Cody for your recent letter. The views leave us breathless! We enjoy reading of your hiking events. So glad that you share these trips with us. We would otherwise never see any of these sights. We pray for your safety as you are out there travelling alone. We are thankful that our grandson, Justin Broadway, has you for a friend. Best wishes for a good year at school for you. Hope you can rejoin Justin next year. Carolyn and Arthur Broadway, Grand Island, New York. Glad I’m not the only one 🙂 Thanks Jane! Hi Cody – I’m enjoying looking at your posts, and would like to follow you, but don’t see a “follow” button anywhere. Is there a way you can highlight this so you can get more followers? Thanks for the feedback, I didn’t realize it was hard to follow. I inserted a follow button in the “About Me” section. Just click the square with the 3 bars in the upper right corner of any page and hopefully you’ll find the “Follow” button for other WordPress users there. Also, there should be a follow button in the lower right corner if you’d like to subscribe by email. Let me know if this helps, although I’m not sure what else to do. I think the problem mostly has to do with the theme I’ve chosen which is more “visually appealing” rather than functional. Thanks! Found it! I’ve noticed this on a few other themes lately, as well. Thanks. Amazing, glad to see you are living your dream Cody. took a while to find your page. Miss you back in Spokane.